1. What is Windows Mail? Windows Mail is a free E-mail program forWindows 8. It replaces Outlook Express that appeared on Windows XP and Windows Mail on Vista. It supports standard E-mail protocols used by most Internet Service Providers (ISPs) such as POP3 (Post Office Protocol 3), IMAP and SMTP (Simple Mail Transfer Protocol) and also can use Web based Email sites such as Hotmail and others. You can also read NewsGroup sites using Windows Mail, which are public forums on 1000s of topics including computing, religion, politics, tv, films, sci-fi, industry and so on. 2. Where is Windows Mail? Mail now uses the new Windows 8 interface and runs using the WWAHost.exe. The old address book program is called wab.exe in the folder C:\Program Files\Windows Mail. 3. 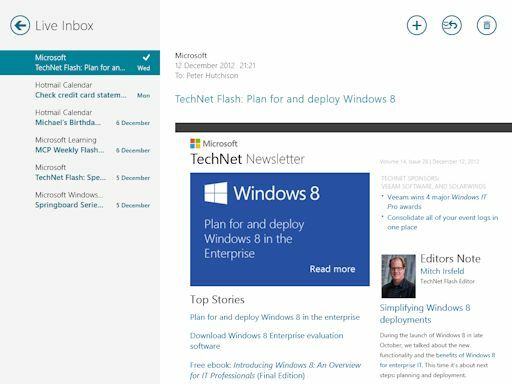 How do I share my Email between different users on Windows 8? In Windows 8, Email is stored on each users profile in C:\Users\<username>\AppData\Local\Packages\microsoft.windowscommunicationsapps_<char string>\LocalState\Indexed\LiveComm\ and it is not possible to share mail unless you switch to another Email Program such as Thunderbird and store email in c:\Users\Public. 4. How do I uninstall or reinstall in Windows Mail? No, it cannot be uninstalled as Mail is built into Windows 8. 5. How do I import my old Outlook Express or Windows Mail messages? Open the Windows Easy Transfer tool to backup mail from your old computer and import the Email into Windows 8. If you upgrade your computer to Windows 8, your old mail will be imported for you. 6. How do I import my old Address Book contacts? Open the Windows Easy Transfer tool to backup mail from your old computer and import the Contacts into Windows 8. If you upgrade your computer to Windows 8, your old contacts will be imported for you. 7. How do I print my Email messages? Open the message, the move the mouse to the bottom right to open the charms, then select Devices and then Print to print it out. Alternatively, right click the message, click on the More icon at the bottom and then select Print. 8. Where are my mail messages stored? By default, Windows 8 will store them in a directory i nC:\Users\<username>\AppData\Local\Packages\microsoft.windowscommunicationsapps_<char string>\LocalState\Indexed\LiveComm\. 9. Where are my Contacts stored? You can view your contacts, by loading the People app from the start menu. Your list of Contacts and Groups for Mail Live are stored in contact files in c:\Users\<username>\AppData\Local\Microsoft\WindowsLive\Contacts\Default\. 10. I am unable to send or receive mail? For Mail ,check your account settings, open charm menu , select Settings, Accounts, Email Accounts, Properties and look under the Servers tab and make sure the incoming/outgoing servers are correct and the username and password are correct (supplied by your ISP). Sometimes the mail server may be down (check the ISP's web site for scheduled downtime periods). For AOL Users you must use AOL Mail! 11. How do I add another account to Windows Mail? Move the mouse to the bottom right, to open the charms menu, select Settings, Accounts, then Add an Account and enter a details for new account. You can add an account for Outlook.com (incl. Hotmail, Live), Exchange, Google, Yahoo and Other account (EAS, IMAP). 12. I have received some e-mail with pictures, but they are not displayed? In Mail, you may need to unblock the pictures by right clicking the message at the top of window. 13. How do I backup my Email? Your email is stored in your profile folder and you just need to backup your entire Windows Mail folder (see Question 8). You can use File History or the Windows Easy Transfer program. 14. I have upgraded to another Email program from Windows Mail, how do I transfer my messages? Outlook Express can be Exported to Microsoft Outlook or Exchange from within Outlook Express (See File, Export). For other email programs you need to check the Import facilities for that program. 15. Can I read my mail from a web browser? You can read only new mail from a WebMail page provided by your Internet Provider, check their website for this facility. 16. How can I stop Spam from entering my Inbox? Windows Mail has a a Junk E-Mail feature, so you can sent a unwanted message to the junk list by right clicking the message and select Junk (or press Ctrl+J) on the bottom pop menu. 17. Does Windows support a Calendar feature for meetings etc? Yes, you can access the calendar via the start menu and select Calendar app (shows current date on the tile). You can add new entries by right clicking the calendar and clicking on New on the bottom menu and enter date, time, location, who and the message for the entry, then click on the Save icon at the top right. 18. Can I export mail back into Outlook Express format? No, you cannot export mail from Windows Mail. 19. What other mail programs can I use? There are a number of third party mail programs including Thunderbird, Opera Mail, Corel WordPerfect Mail, Microsoft Outlook, and others. Online email programs include Outlook.com, Google Mail and web mail pages provided by your ISP. 20. How do I remove or change an Email profile? In Mail, select Settings on the charm menu, select Accounts, then select the account from the list and at the bottom select Remove Account.